Emma Kirkby is in glorious voice throughout this splendid recital, floating the opening line of Salve Regina most beautifully, and then dashing away to a sparkling accompaniment in Eja ergo. ... Finest of all is the setting of Psalm 112, where she soars up to the heavens on a characteristic repeated phrase and sings flowingly and ravishingly against a particularly attractive accompaniment... 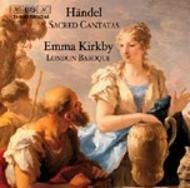 This is one of Kirkby�s very finest Handel records. Her voice is caught with a lovely bloom, and the balance with the accompaniment is just about perfect. Not to be missed.